A blue-striped nose, GTE badge and bright geometric daylight lamps mark out a new option for buyers of Volkswagen’s Golf. The popular German hatchback can now be bought as a plug-in hybrid, as well as in petrol, diesel or entirely battery-powered guises. 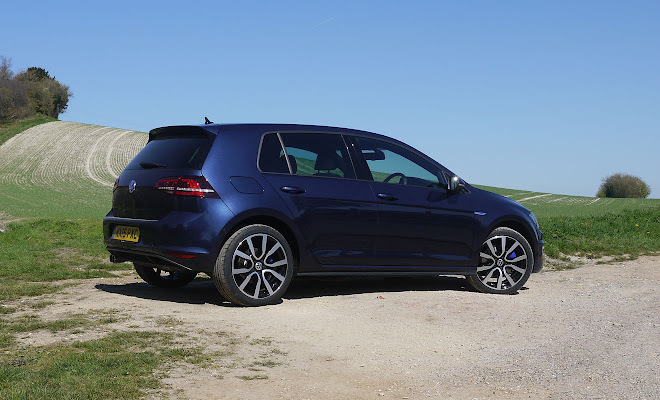 The new addition slots in near the top of the sprawling Golf range, rubbing shoulders with the petrol GTI and diesel GTD in both price and performance terms. 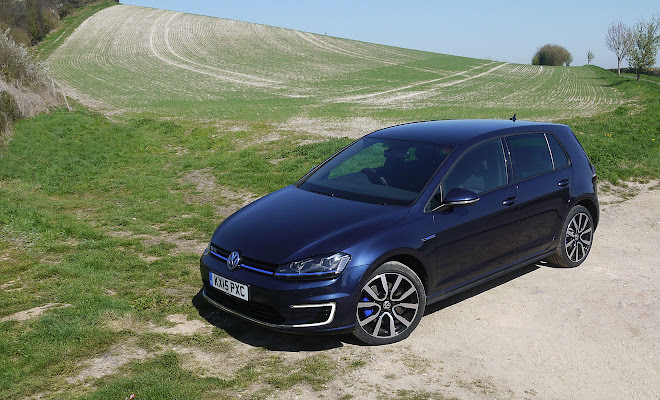 Despite its canary yellow charging cable and lithium-ion battery pack, the GTE is not really pitched as an eco car – that’s the thrifty job of the diesel BlueMotion Golf, as well as the imminent petrol-powered BlueMotion TSI. As the GT in its name suggests, VW’s new plug-in Golf is aimed at people who expect a bit of pace. However, the GTE is a Jekyll and Hyde car that can be incredibly frugal when it’s not tearing around, especially on shorter trips. The car always wakes up in battery-powered “e-mode” and, according to VW, can travel up to 31 miles before needing to fire up its petrol engine at all. It can remain in electric mode all the way to 85mph, though you won’t achieve full range at anything like that speed. But pop to the shops or drop your sprogs at school, and you may not need to get the engine out of bed. A full recharge takes 3 hours and 45 minutes from a three-pin plug, or 2 hours and 15 minutes from a wallbox, VW says. Under the bonnet there’s a 1.4-litre, four-cylinder TSI petrol engine providing up to 150 horsepower and 250Nm of torque. It drives the front wheels through a six-speed dual-clutch automatic gearbox. Between the engine and the double clutch sits a substantial electric motor, which also serves as a generator during braking. It can summon up just over 100 horsepower with a peak low-speed torque of 330Nm. Combined, the engine and motor have been tailored to provide an overall 204 horsepower and 350Nm of torque. Lower than simple arithmetic might suggest, this total puts the GTE just a little behind the iconic GTI – triggering the suspicion that the plug-in car might have been dialled back from its full potential to save the GTI’s blushes. An 8.8kWh battery pack sits crosswise under the GTE’s rear seats, with the petrol tank having shifted rearward from its usual spot to make way. 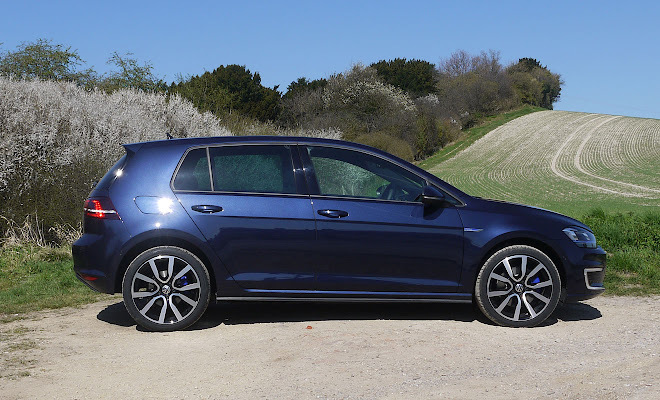 With the tank now under the boot floor there’s no option of a spare wheel, and about a third fewer litres for luggage than in other Golf models. 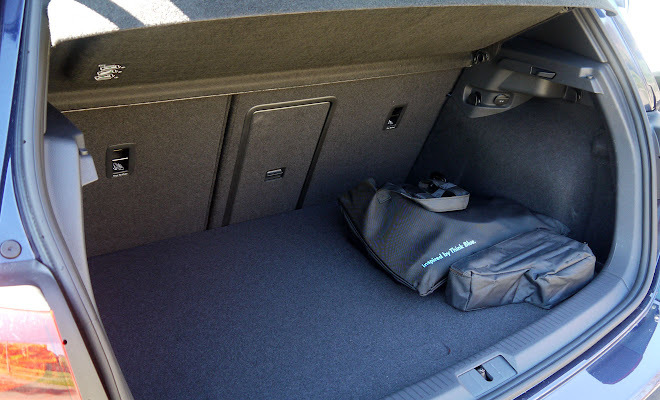 The difference is much less noticeable when the rear seats are flopped forward, of course. The extra hardware does mean the GTE has gained weight compared to simpler Golfs. 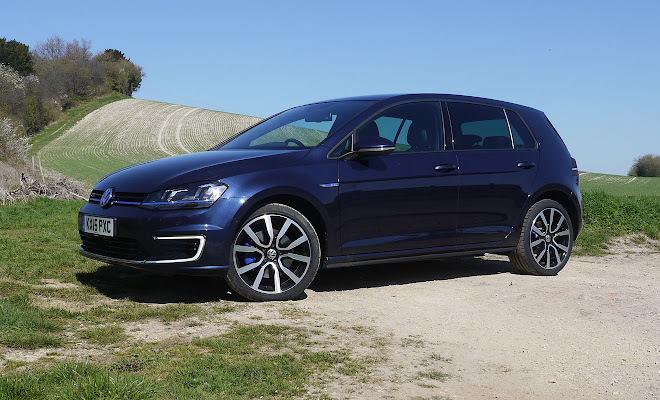 The battery weighs 120kg and when added to the motor, power electronics and other modifications there’s 300kg more on board than in a standard 1.4-litre Golf, leading to a not-so-svelte 1.6-tonne kerb weight for the GTE. A GTI, with its bigger engine, is about 200kg lighter, or almost the same difference as leaving three whole people behind. Unsurprisingly, the stopwatch bears witness to the GTE’s extra heft. Getting to 62mph in 7.6 seconds seems pretty swift until compared with the GTI’s 6.5 seconds. By most measures the GTE still feels like a quick car, especially if you prod the GTE button lurking on the far side of the gear lever. As well as unlocking full performance, this button brings up extra engine noise, which I assume is fake and piped through the speakers. Even if it does sound a bit PlayStation, it succeeds in making you feel more involved. There is a tiny rev counter in the instrument cluster, set within the more noticeable sweep of the GTE’s power gauge. This shows energy regeneration when slowing down or power output when accelerating. Hammer along in GTE mode and the needle will swing past 100% and on through the “boost” segment of the dial before shifting up a gear, and indeed you can feel the extra shove through your backside compared to lesser driving modes. 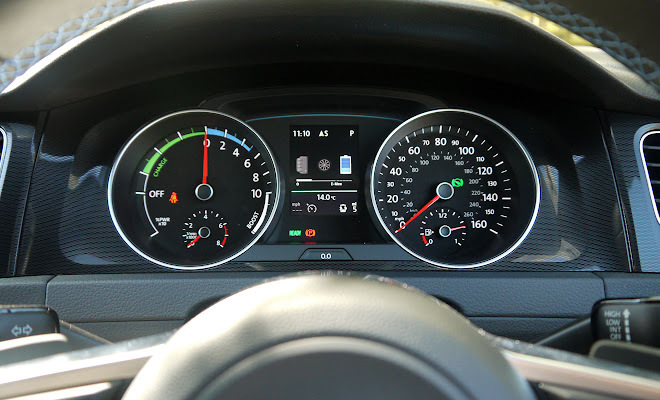 E-mode and GTE mode account for only two of five driving options. There’s also a setting for recharging the battery on the move, which sounds like a waste of petrol to me, a battery hold mode for maintaining charge – useful if you know you’ll be doing some urban crawl at the end of a high-speed blast – and finally hybrid mode, which will spread out electrical assistance in aid of economy. 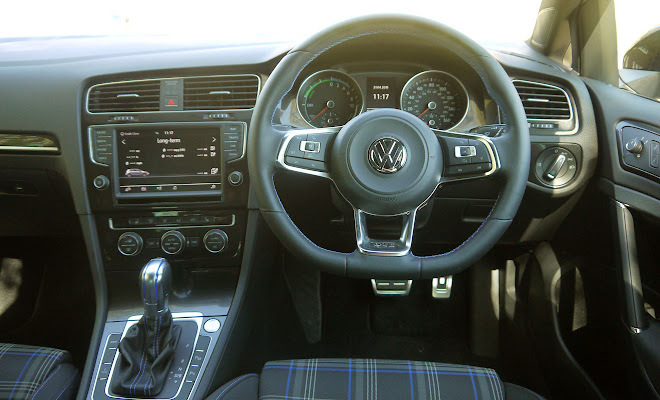 In other Golfs, all available driving modes can be called up simply by pressing one button – stabbed repeatedly to scroll through all the options or once to bring up a menu on the central touchscreen, so you can jump straight to the option you want. For reasons best known to VW, some of the GTE’s five modes are as fiddly to unlock as the inside of a walnut. As mentioned, the car starts up in electric guise. Press the e-mode button and you’ll switch back and forth between electric propulsion and the battery-hold setting. The separate GTE button calls up either full pelt or battery saving again. To get at the remaining two modes, you have to press the “Car” button beside the touchscreen, then prod the mode icon at the bottom of the screen, and finally choose the hybrid or charging option from a menu of all five choices, where each is about half the height of a fingertip on the screen. This fiddly procedure is not something I’d recommend on the move. If there’s a simpler way to get at hybrid mode I couldn’t find it. As well as these options you can also overrule the automatic shifts of the six-speed gearbox with paddles behind the wheel, and call up additional regenerative braking with a tug at the gearlever. 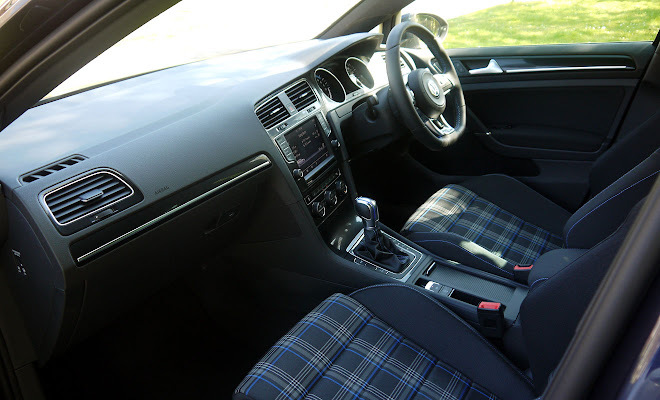 Inside, the GTE provides much the same style as you’ll find in the GTI, although with blue stitching and blue tartan in place of red. Alas you don’t get a dimpled golf-ball on top of the gear lever because even in the GTI that comes only with a manual gearbox. In common with the rest of the Golf range, the interior of the GTE is supremely well screwed together – it’s a place of high-quality materials where everything moves with oiled precision and reassuring clicks. Personally, I’d prefer the touchscreen higher up in the centre stack, while some of the buttons and the electronic handbrake were never swapped for right hand drive, but that’s the level of nit-picking required to find fault. Ride comfort is firm but not so unforgiving as to rattle your jaw. With sports suspension, 10mm lower than lesser Golfs, plus 40-profile tyres on 18-inch alloys, you’d be surprised not to feel a few lumps and bumps through your seat. The brakes feel as powerful as you’d hope for a quick and hefty car, and the transition from regenerative to mechanical braking as you press the pedal progressively harder has no detectable joins. The thick-rimmed wheel is nicely weighted and provides a good sense of what’s happening under the wheels. Recharging the car should be straightforward as long as you’ve got somewhere to park in reach of a plug. And as long as you’re not as stupid as me. I managed to strand myself for a while after plugging the cable into the charging socket in the GTE’s nose, simply to take a photograph. 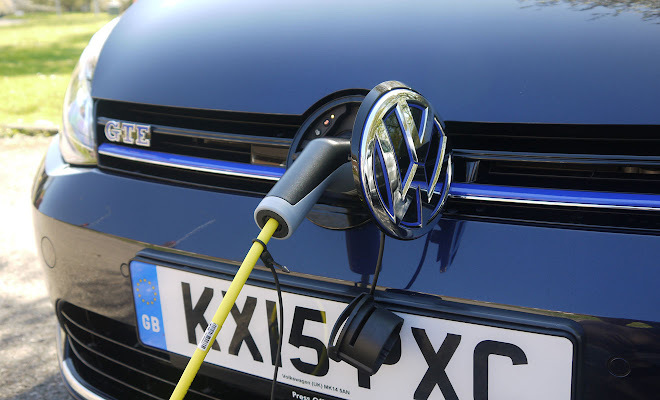 The car clings onto the cable with the determination of a dog to a stick – a measure designed to stop people stealing your cable or unplugging your charging GTE. You have to unlock the cable before you can tug it free. One caveat being that if the car isn’t switched off the cable won’t unlock no matter what button you press, how hard you tug or how many times you scratch your head. That’s one of a number of wrinkles that made me feel that VW hasn’t quite got the GTE right. It’s a complicated car with a lot of different options, not all of which are presented in a fuss-free fashion. Cars like the Mitsubishi Outlander and Volvo V60 plug-ins are just as complex but feel less confusing. Once you get your head around its foibles, however, the GTE feels like a very tempting, cake-and-eat-it car.